The South is known for many things including great food, great music, various forms of entertainment, amazing weather and scenery. Memphis alone was voted in the “Top 10 Places to Live and Work As A Movie Maker,” “Number One American Iconic Street” for USA Today, “Number One Best Sports Franchise In North America” in ESPN and more, as reported on MemphisRap.com. 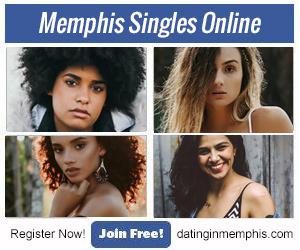 There are many reasons Memphis, the Mid-South and Southerners abroad have to be proud, but after viewing some maps shared in a Huffington Post article, some people in Southern states may absolutely be outraged. 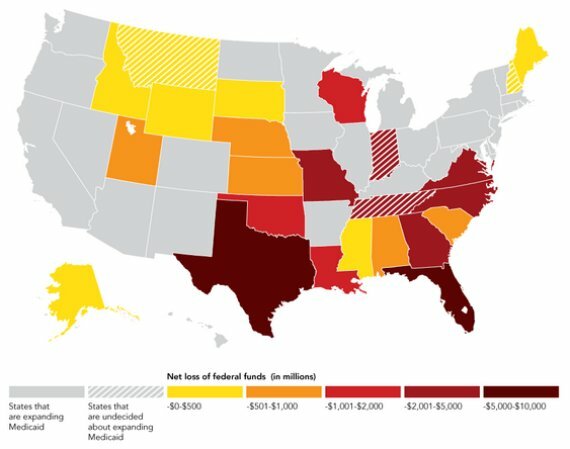 First, in the list of maps, is a map showing the poverty rates, which are a lot higher in the South than other states. A reported more than 1 in 4 kids in the South live in poverty compared to the nation’s average of 1 in 5. Areas in red on the map show poverty rates of between 17.9 and 22.8 percent while orange is 15.9 to 17.8 percent, light orange is 12.2-15.8 percent, pale yellow is 9 to 12.1 percent. 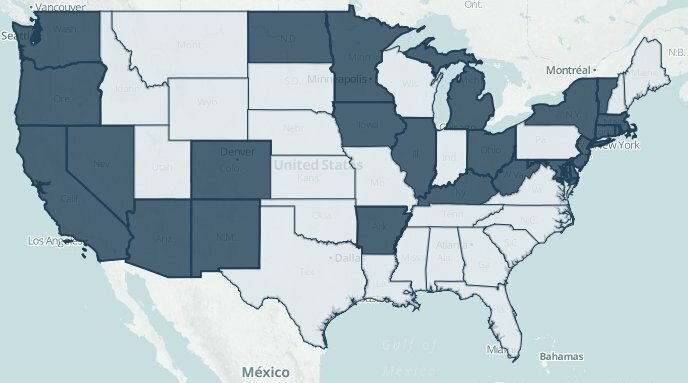 Next up is a map that shows minimum wages, which are much larger than other states outside of the South, don’t come with laws to support higher minimum wages in the South. 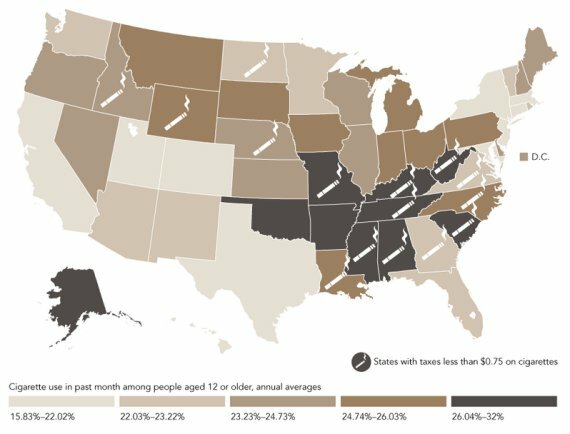 This, in turn, is reportedly costing the Southern states tons of money as seen by the same states on this map that rejected Medicaid expansion will lose tons of money by 2022 and this is assuming that the other states do participate in the Medicaid expansion. 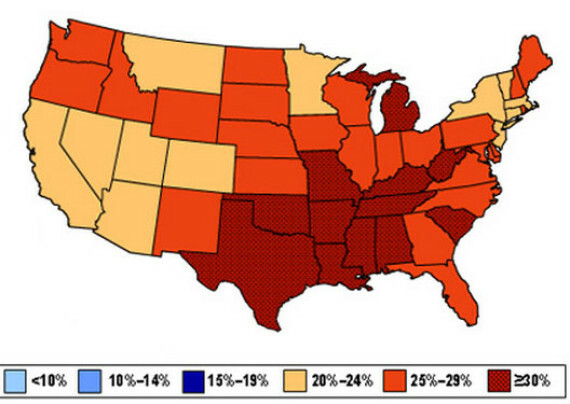 In addition, the South is also the area on the map that has a high rate of obesity as seen below. 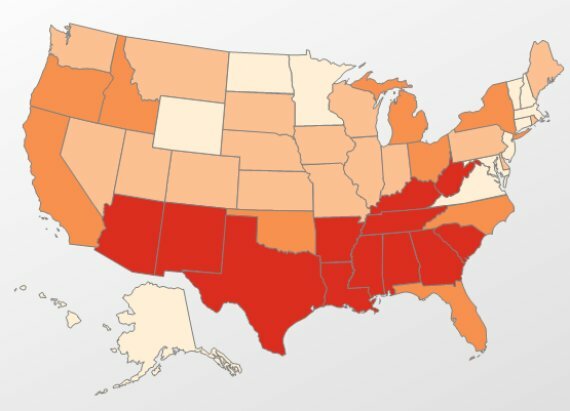 On top of the obesity, which is a health crisis within itself, Southern states also have the highest percentage of cigarette smokers in the country as indicated by this map below. 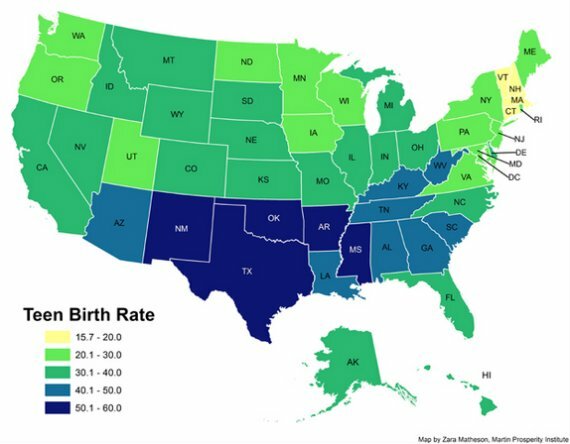 To make matters worse, Southern states have a higher rate of teen births in the country, which the map below shows in the darkest areas of blue. In those areas of dark blue, there are 50 births per 1,000 teens ages 15 to 19 in the South. 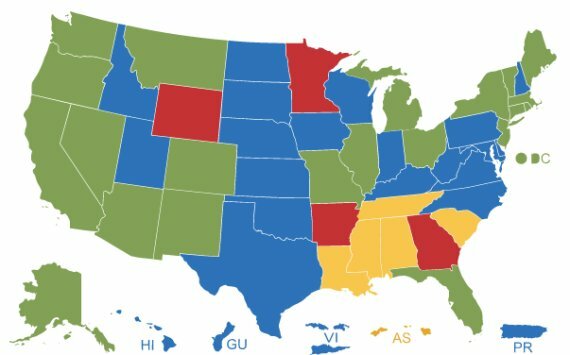 Last, but not least, one map shows that people in the South are in the least happy states in the country. 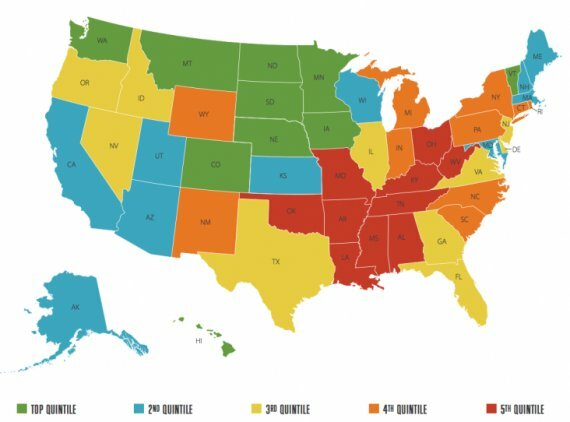 The Gallup report ranked states by a survey of several thousands of Americans on the following: health emotionally, health physically, life evaluation, healthy behaviors, work environment and access to basic elements like food, water and shelter. So Basically… 1 in 4 kids in TN is in poverty, We have NO MINIMUM Wage Law, we are less likely to move up the economic ladder to be apart of the “AMERICAN DREAM”, We don’t want Obama Care, over 30% of us are over weight, we are also HEAVY CIG SMOKERS , teens are having babies outrageously, and on an OVERALL health issue… WE JUST F***ED up… Hmmm I think I can see that.